It’s that time of the year again and chances are you won’t just be cooking the bird for one meal, in fact I bet you cook a turkey two times! Big crowds, lots of family and the need to feed in bulk often culminate the cooking storm! So it all begins, with Thanksgiving until New Year’s Eve and the cooking festival we trot into starts off great and often just starts to take us over. Classic Bread and Celery stuffing is an easy-to-make recipe that can feed the masses as a side to any chicken or pork dinner! My Classic bread and celery stuffing has been handed down from generation to generation and it does not have to be cooked inside the bird! Here’s a step-by-step recipe to help you create a delicious tray of classic bread and celery stuffing so you can lavishly live food out loud. This stuffing is meant to be cooked outside the bird, but you can cook it in the cavity of the turkey as well. I will tell you I have one secret behind the success of the veggies cooking evenly and perfectly! It is very important that the veggies do not stick, burn or get overcooked as they are what makes the stuffing so darn moist. Preheat oven to 350° Fahrenheit and spray 2, 9 x 13 Glass Casserole Dishes with Non Stick Spray. Place Bread Cubes in a bowl. 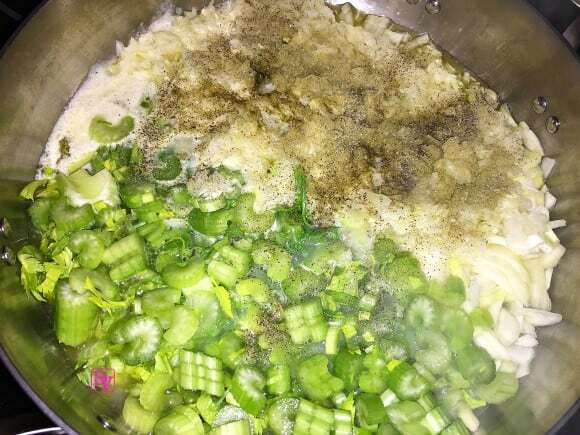 In a large skillet, add one stick of butter, chopped onions, and celery, along with 1 Cup of Chicken Broth and poultry seasoning. Cover this and allow it to steam and tender the vegetables. Once Veggies are fork tender, softened, add to bread cubed mixed and mix well. Divide the batch into 2 equal portions and slice butter pats on each, splitting the 2nd stick of butter evenly between both casseroles. Add 3 C remaining broth between 2 Casseroles(1 1/2 C Each) Cover With Foil and Bake at 325° Fahrenheit for 35 minutes. Serve Warm, refrigerate leftovers. You can print this easy peasy recipe for stuffing right here! In a large skillet, add one stick of butter, chopped onions, and celery, along with 1 Cup of Chicken Broth and poultry seasoning. Cover this and allow it to steam and tender the vegetables. Once Veggies are fork tender, softened, add to bread cubed mixed and mix well. Divide the batch into 2 equal portions and slice butter pats on each, splitting the 2nd stick of butter evenly between both casseroles. Cover With Foil and Bake at 325° Fahrenheit for 35 minutes. 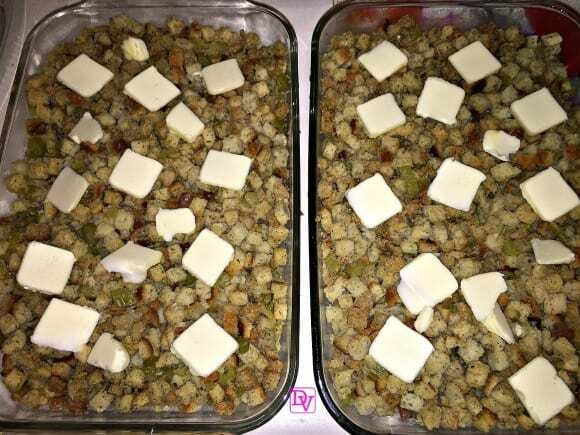 What made making this stuffing so easy? The answer to this is super easy, in fact the answer is Calphalon. I do love my Calphalon cookware and the Calphalon Signature 5-qt. 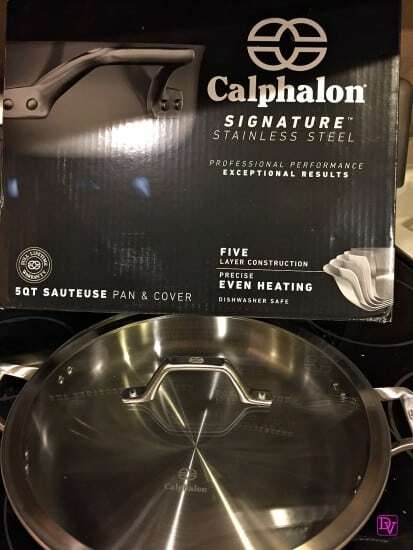 Sauteuse with Cover rocks the world of Calphalon Signature Stainless Steel. This offers me five layers of metal that delivers pro-even heating and very precise temperature control. There are no ‘warm’ spot and the food cooks perfectly even and when getting veggies all tender and set to mix into another part of a recipe it is REALLY important. All foods made in this 5 Qt Sauteuse are evenly cooked, sear to perfection, and are great tasting and you are able to have this much control in your own kitchen! This type A loves this pan for all the reasons above! I have always wanted an exquisite piece such as the 5 Qt Sauteuse as it will make a great sauce, a delicious pasta and of course I can only image a Chicken Cacciatore in this pan! 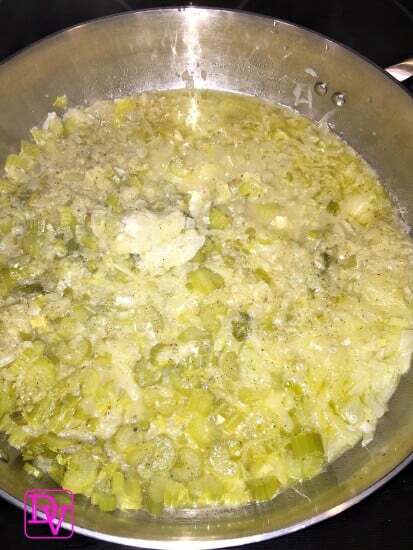 The Celery and onion cooked perfectly, and nothing burned, or browned, while the butter melted and the broth just cooked into the taste! YUM. The secret behind Classic Bread and Celery Stuffing is in the pan. Enjoy cooking this recipe and lavishly live food out loud, enjoying the holiday and living in the moment! Images, story and recipe are my own. affiliate links contained within. Such a great idea of you. This really looks yummy and a healthy food. thank you for sharing this with us. I really like the sound of this. Celery and stuffing is a great combo. Stuffing is one of my favorite things about Thanksgiving and honestly the only time of year I eat it. This recipe looks delicious and I love that you mentioned Calphalon which is one of my favorite brands! This seems like a great classic recipe that isn’t too challenging to make! It also seems like a great option for vegetarians and non-vegetarians, Thanks for sharing! thank you Mardene. You are fabulous! Stuffing is my favourite! This one looks great! Shaylee recently posted..Chris Heivly (Co-founder MapQuest) on Entrepreneurship, Startups, and Life. This is a novel idea I have never heard of doing his but it sounds so tasty. That looks like a yummy stuffing. Hope you had a wonderful celebration. That looks so delicious! I love the pot as well! It looks so durable. This reminds me of my parents dressing. So yummy. We always have leftover turkey, but never any leftover stuffing! I’m going to try this asap to have with our leftovers. I love cooked celery! Jessica Harlow recently posted..Enter to win a Tungsten Men’s Wedding Ring!